Made from only the highest quality ripe and juicy blueberries, blackcurrants and cranberries, and Grade A Pure Canadian maple syrup, our four new delicious premium syrups are bursting with fresh sweet berry and maple flavours. whichever flavor takes your fancy! Our Raisa‘s syrups have no frills — they‘re just the pure taste of sweet and juicy summer berries. 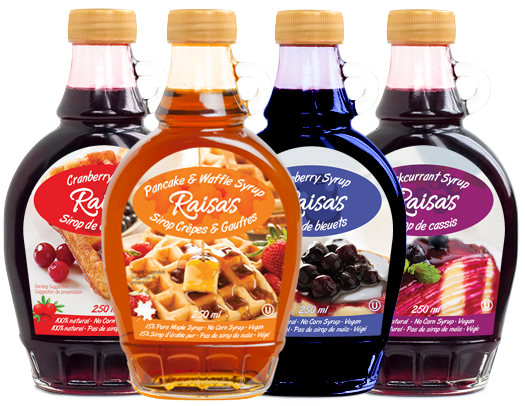 All Raisa‘s berry syrups are blended with 100% maple syrup, one of nature‘s purest sweeteners. Free of any preservatives, coloring or additives, and absolutely no high fructose corn syrup! Instead evaporated cane juice, which undergoes less processing than white sugar, is added, and enhances the berry flavors. Maple syrup is made from the sap of sugar maple, red maple, or black maple trees. In cold climates, these trees store starch in their trunks and roots before the winter; the starch is then converted to sugar that rises in the sap in late winter and early spring. Maple trees are tapped through small holes into their trunks and the exuded sap collected, which is processed by heating to evaporate much of the water, leaving the delicious concentrated syrup. 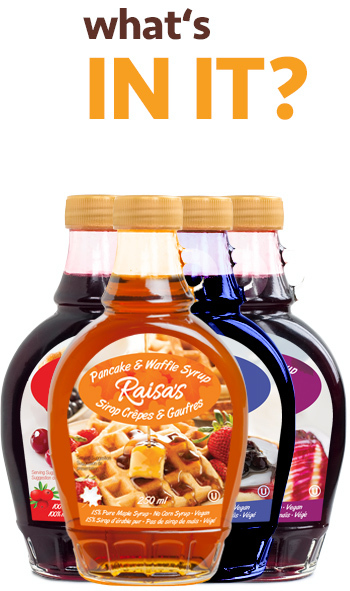 At Raisa‘s we then take Grade A Pure Canadian maple syrup and blend it with 100% blackcurrant, blueberry and cranberry juice concentrates and pure evaporated cane juice, creating our trademark thick and tasty berry syrups - ready to dribble onto fresh morning pancakes, poured over favorite ice creams, drizzled over crisp waffles, or spooned around pound cakes for a bright burst of color and taste. It‘s not surprising that an increasing number of health-conscious consumers are bypassing white and brown sugar, stevia and artificial sweetners in the grocery store in favor of pure Canadian maple syrup for health benefits in their diet. Some say that the sheer quantity and variety of identified compounds with documented health benefits qualifies maple syrup as the next champion food! Some of the primary antioxidants found in maple syrup include benzoic acid, gallic acid, cinnamic acid, and various flavanols like catechin, epicatechin, rutin and quercetin. Maple syrup provides 37% of the Daily Value of riboflavin, which aids in the metabolic process. Maple syrup also contains 18% of the recommended Daily Value of zinc, which is essential for a healthy immune system. Other minerals found in maple syrup are magnesium, calcium and potassium, decreasing the risk of hypertension or stroke. Maple syrup is an excellent source of manganese, which plays an important role in energy production and antioxidant defenses, and is necessary for normal brain and nerve function. A portion of ¼ cup of maple syrup contains 100% of the Daily Value of manganese. Keep in mind that because consuming too much sugar, from any source, is one of the leading causes of some of the most widespread health problems − like obesity, type 2 diabetes and heart disease − even natural sweeteners like maple syrup should be used in small amounts. When it comes to solutions for reversing diabetes naturally, or other blood-sugar related conditions, it’s best to minimize sugar intake overall and especially to avoid refined sugar.  Raisa‘s syrups are vegan and dairy free, gluten free, halal, kosher, with no artificial preservatives, artificial sweeteners, or high fructose corn syrup.  Instead our syrups are blended with pure maple syrup, a natural sweetener that features over 63 antioxidants that can help delay or prevent diseases caused by free radicals, such as cancer or diabetes. In addition, maple syrup contains high levels of zinc and manganese, keeping the heart healthy and boosting the immune system. In fact, maple syrup has the same beneficial classes of antioxidant compounds found in berries, tomatoes, tea, red wine, whole wheat and flax seed. Blackcurrants, blueberries and cranberries also have high levels of antioxidants. Now you can create even more fantastic teas, smoothies and cocktails packed with flavor. Sweeten tea, hot chocolate, coffee, and eggnog. Or add lush berry flavors and sweetness to pancakes, waffles, fresh fruit, cereal or ice cream. All with our pure and delicious Raisa’s Blueberry, Blackcurrant, Cranberry & Maple Syrups. Go on, treat yourself!